Manostiles new children collection “Forrest” represents a fabulous, sparkling children’s universe, where colours, patterns and quality go hand in hand. 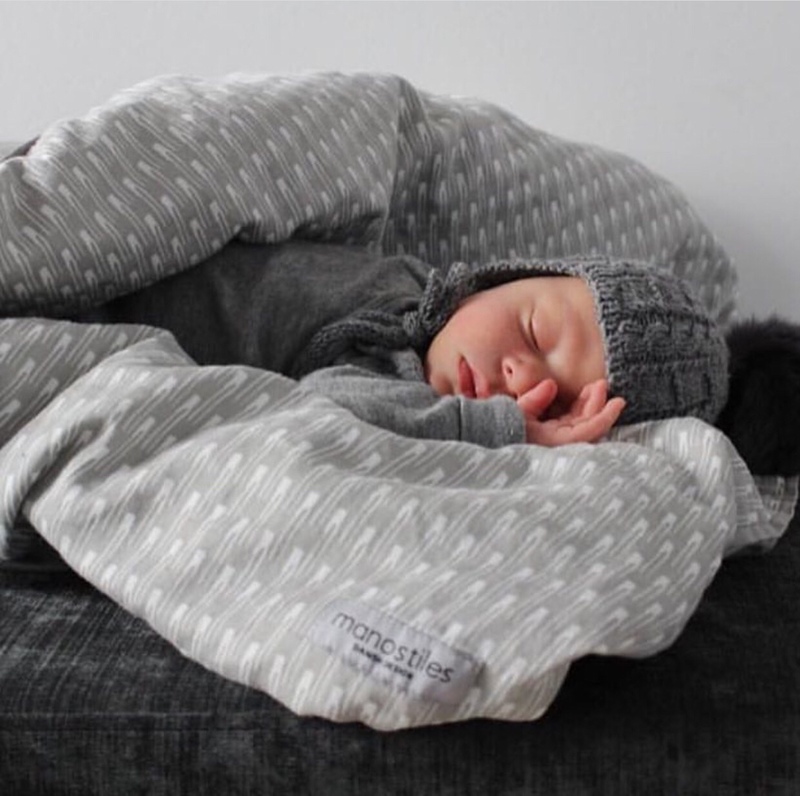 As a part of Manostiles new children collection, there will be more soft news – small, fine organic pillows with print, which will look decorative in a nursery as well as in a pram or in a playing cave. table and on the walls around the cradle. Manostiles children universe has had an excellent start and reception. Everything is in stock the end of September and we are looking forward so much …. 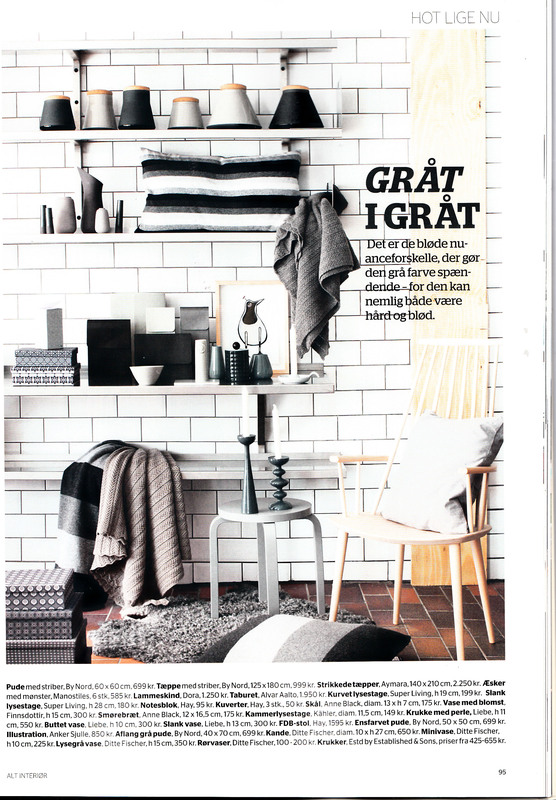 The new Danish magazine “ALT Interiør” features new and interesting interieur products. In an inspiring way they make theme spreads on different subjects and decorating ideas. In this april issue, they have amongst others used Manostiles boxes – have a look! We love it!! 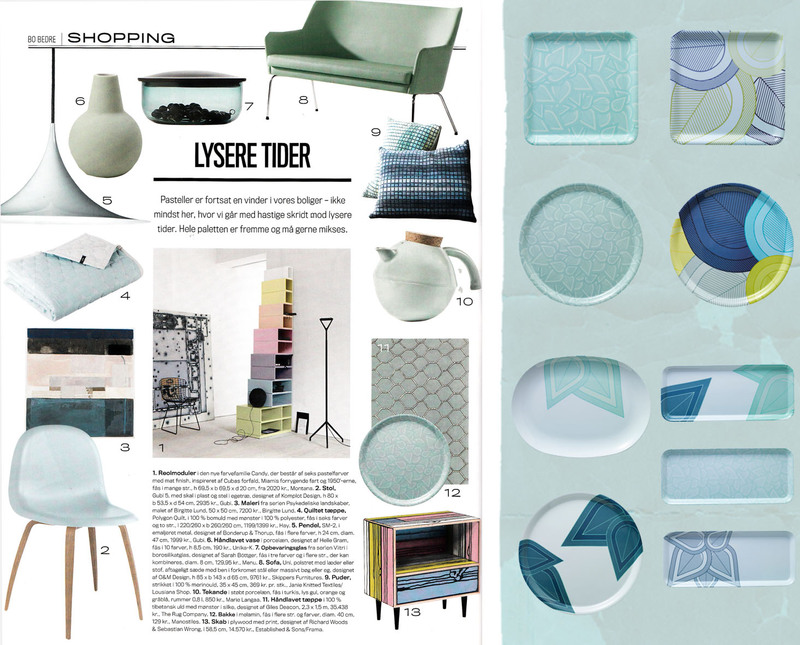 Manostiles is featured in the Danish magazine Bo Bedre with one of our melamine trays.The theme is wonderful pastels – blues, greens and mints in furniture and interieur. The pastels creates spring atmosphere in your home and make promises of brighter times! 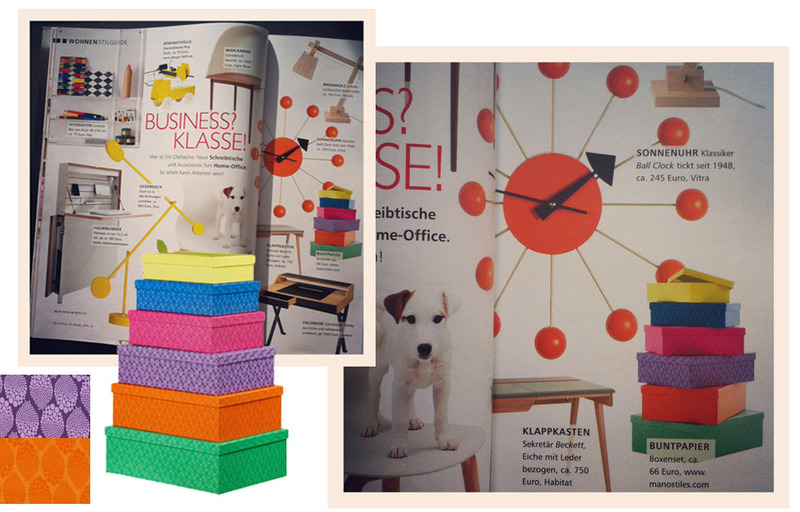 In the april issue of the German Living At Home magazine the Manostiles Color Edition boxes are featured in a spread about interieur at the home office. Once again…we are always grateful when magazines show our products and how they can be used in new and inspiring ways! Er omtale godt når man ingen varer har? Lige så uheldige vi har været med vores leverance, lige så heldige har vi været med omtale af vores produkter. Vi er blevet modtaget så godt, både af pressen og af forhandlere – at det næsten gør endnu mere ondt at vi ingen varer har. Vi vælger at tro at så længe vi bliver præsenteret i bladene, så vil du huske os og dermed glæde dig til at varerne kommer i butikkerne. 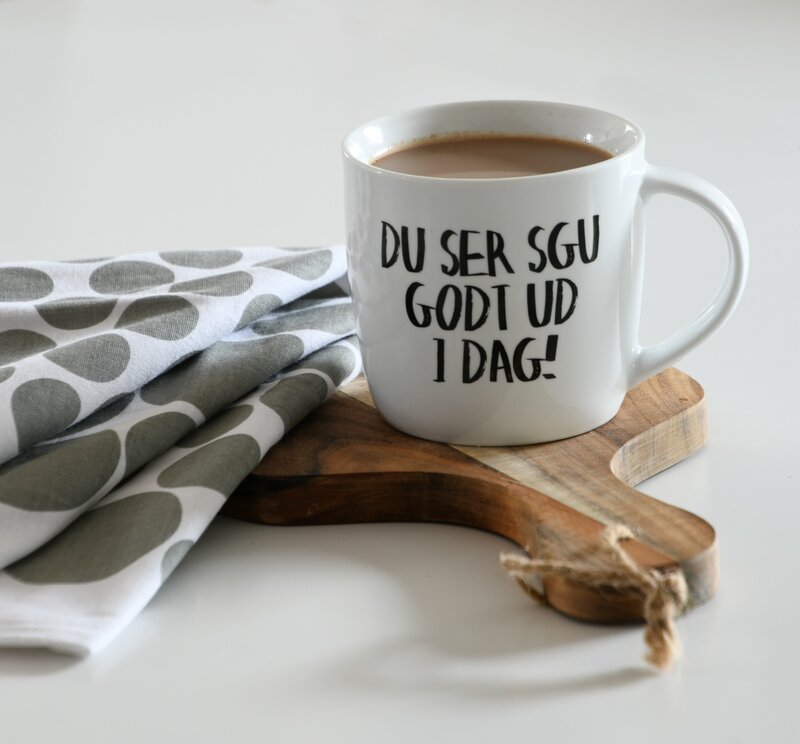 Rigtig god mandag til dig. 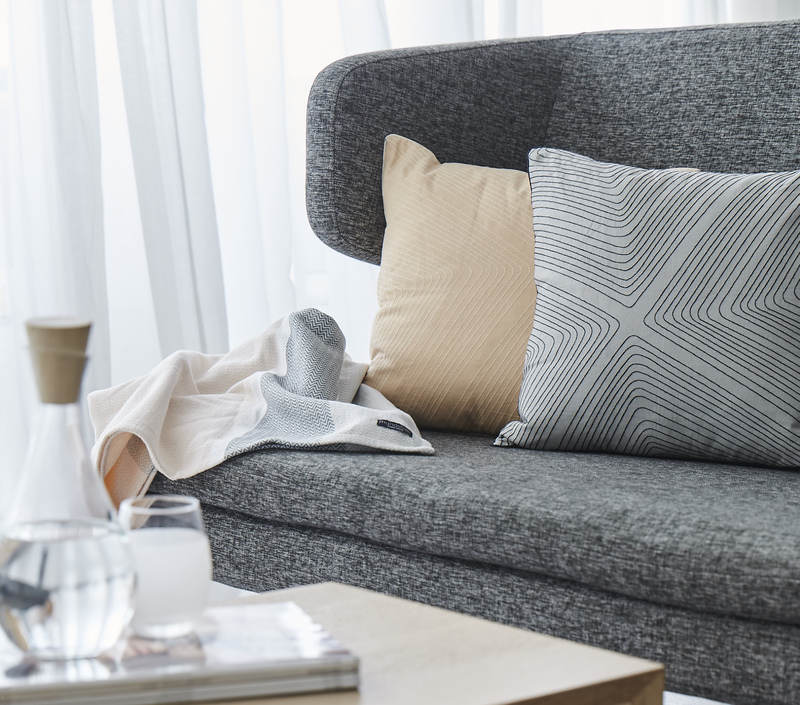 Manostiles is a Danish design company that works with a passion for the way we live and decorate our personal space and surroundings. Manostiles design philosophy is all about creating beauty, inspiring atmosphere and order in our home. Manostiles universe is based on the simple graphic aesthetics, tones and flora that is so delicate and amazing in Nordic nature.